Gerflor is the official and exclusive AVC floor partner for all indoor AVC events from 2019 until 2022. The partnership contract was signed during a ceremony between AVC and Gerflor that took place in Bangkok, Thailand, February 19, 2019. 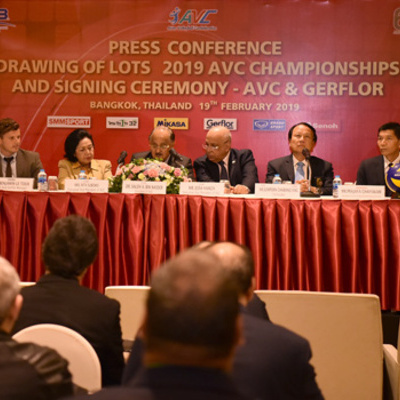 AVC Technical Committee members and a large number of media representatives including TV crew gathered inside the meeting room at Dusit Princess Srinakharin Hotel on Tuesday for the ceremony marking the official signing of the contract between the AVC and Gerflor. Among AVC events, we can name : Men and Women Asian Club competitions, Men and Women Asian Cup competitions, Men and Women Asian Challenge Cup, U17,U18,U19, U20 and U23 Asian competitions, Asian Men and Women championships. So no doubt our sports flooring surfaces will be featured and will contribute to the promotion of volleyball sport in Asia. More information about our Taraflex indoor sports surfaces.